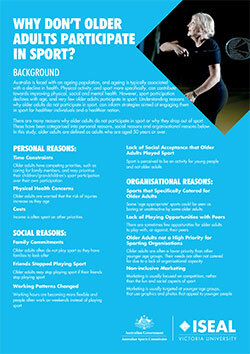 Why don't older adults participate in sport? Jenkin, CR., Eime, RM., Westerbeek, H., O'Sullivan, G., van Uffelen, JGZ (2016). Are they 'worth their weight in gold'? 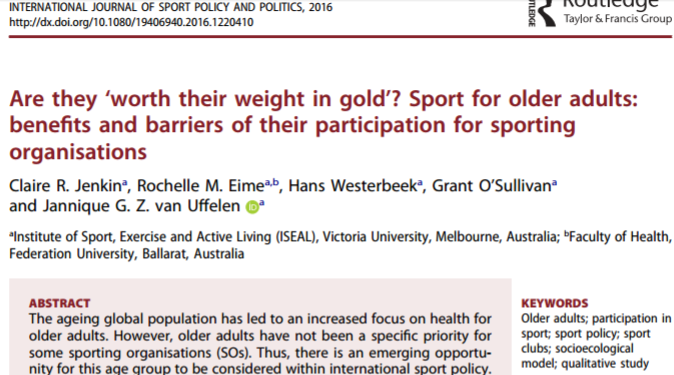 Sport for older adults: benefits and barriers of their participation for sporting organsiations. International Journal of Sport Policy and Polititcs. Jenkin, C., Eime, R., Westerbeek, H., van Uffelen, J. 2016. 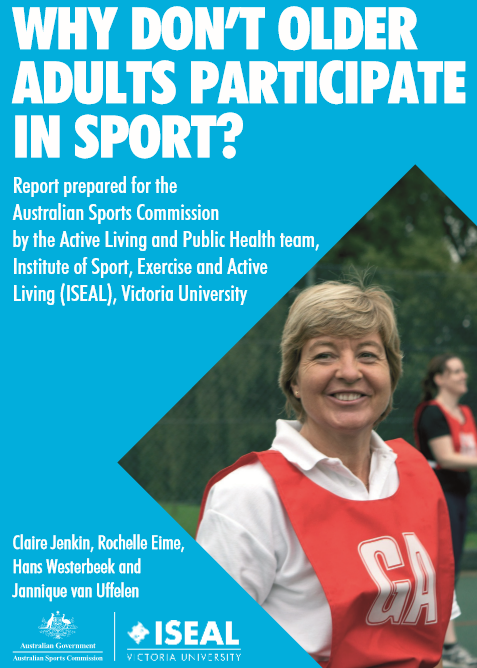 Why don't older adults participation in sport? Symons, C., Polman, R., Moore, J., BOrkoles, E., Eime, R., Harvey, J., Craike, M., Banting, L., Payne, W (2013). 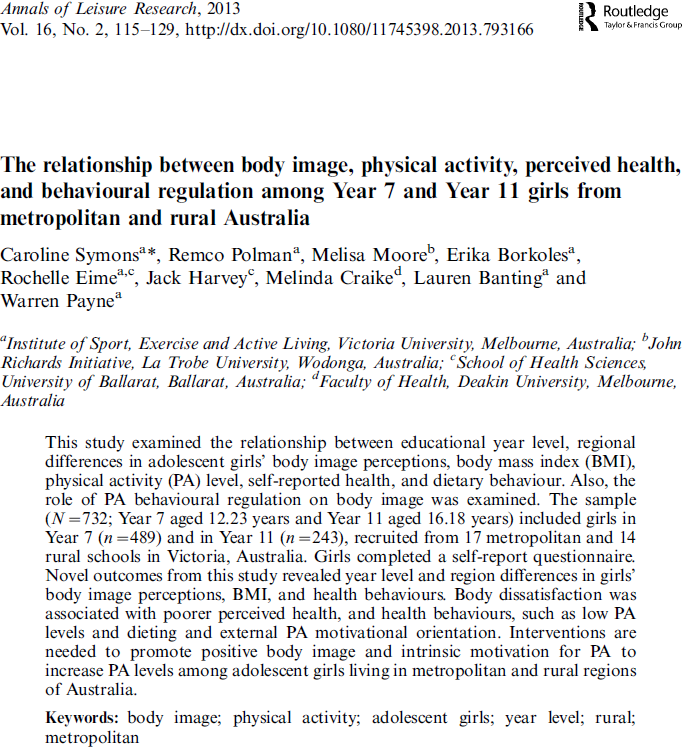 The relationship between body image, physical activity, perceived health, and behavioural regulation among Year 7 and Year 11 girls from metropolitan and rural Australia. Annals of Leisure Reserach, 16(2) 115-119. Craike, M., Symons, C., Eime, R., Harvey, J., Payne, W. (2011). 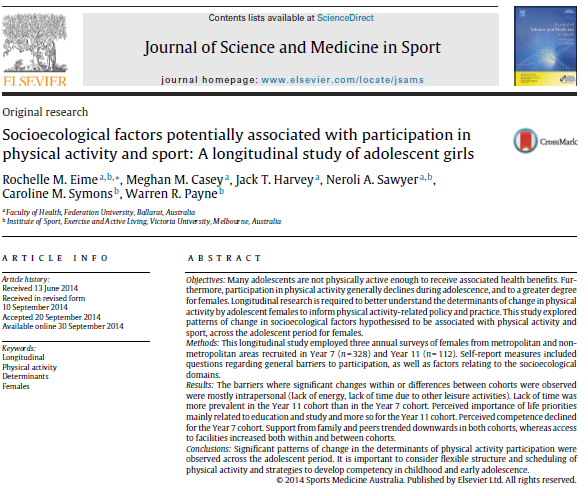 A comparative study of factors influencing participation in sport and physical activity for metropolitan and rural female adolescents. Annals of Leisure Research 14 (4) 355-368. Casey, M., Eime, R., Payne, W., Harvey, J. 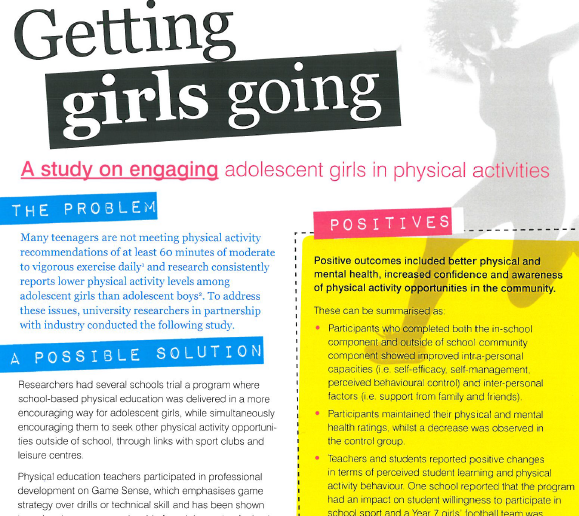 (2009) Using a socioecological approach to examine participation in sport and physical activity for rural adolescent girls. Qualitative Health Research. 19 (7), 881-892. 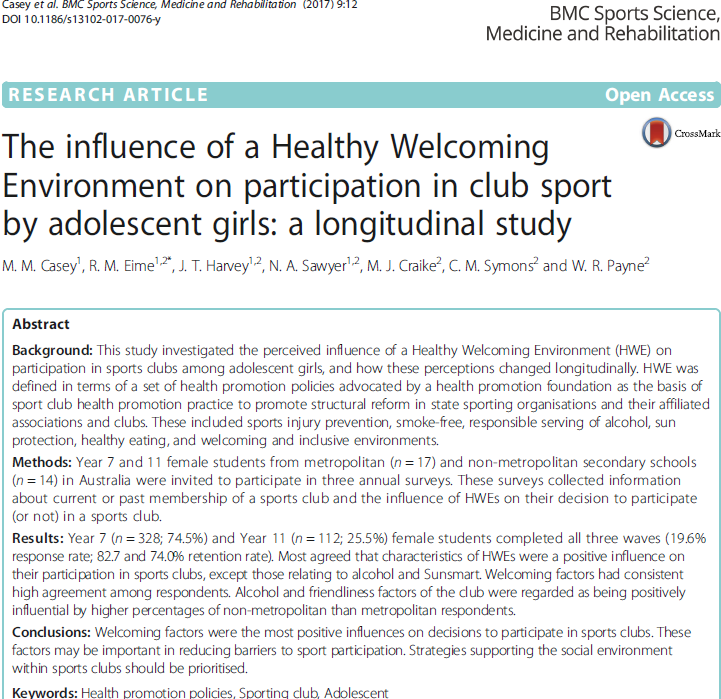 Casey, M., Payne, W., Eime, R., Brown, S. (2009) Sustaining health promotion programs within sport and recreation organisations. Journal of Science and Medicine in Sport. (12) 113-118. Casey, M., Payne, W., Eime, R. (2012). Organisational readiness and capacity building strategies of sporting organisations to promote health. Sport Management Review. 15(1) 109-124. Casey, M., Harvey, J., Eime, R., Payne, W. (2011). The test-retest reliability of a health promotion assessment tool in sport. Annals of Leisure Research 14(4) 304-324. Casey, M., Payne, W., Eime, R. (2009) Building the health promotion capacity of sport and recreation organisations: a case study of Regional Sports Assemblies. Managing Leisure. (14), 112-114. Casey, M., Payne, W., Eime, R. (2009) Partnership and capacity building strategies in community sport and recreation programs. Managing Leisure. (14), 167-176. 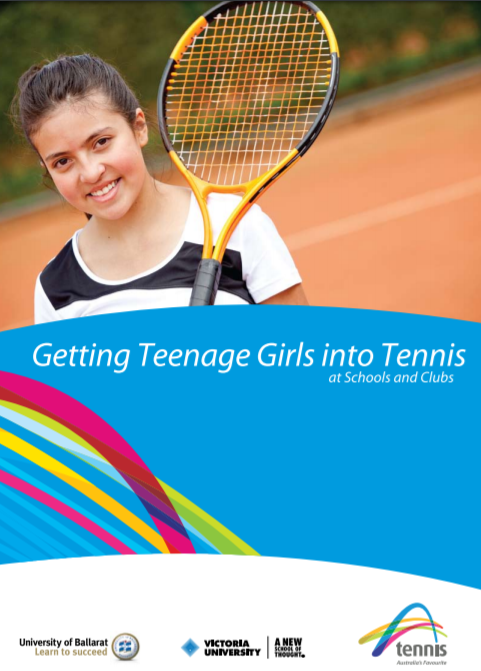 Linking participants in school-based programs to community clubs. 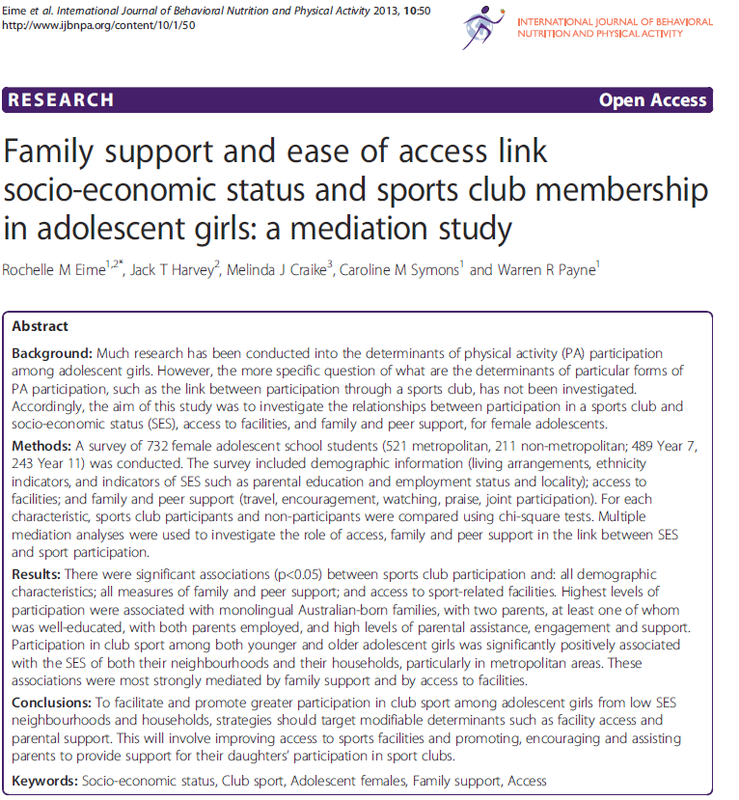 Eime, R., Payne, W. (2009) Linking participants in school-based programs to community clubs. Journal of Science and Medicine in Sport. (12) 293-299. Eime, RM., Charity, MJ., Harvey, JT., Payne, WR. (2015). 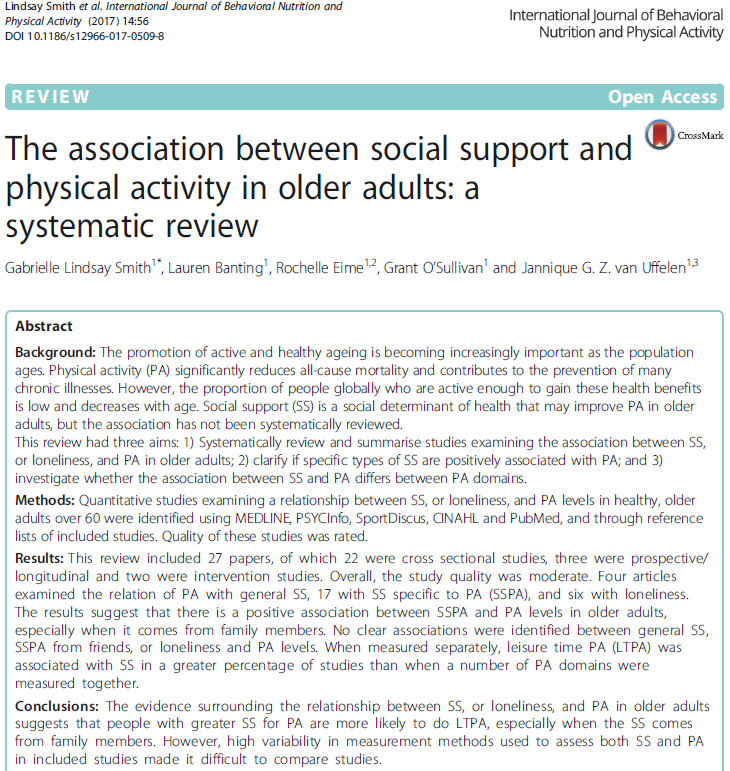 Participation in sport and physical activity: associations with socio-economic status and geographical remoteness. BMC Public Health. 15:434. 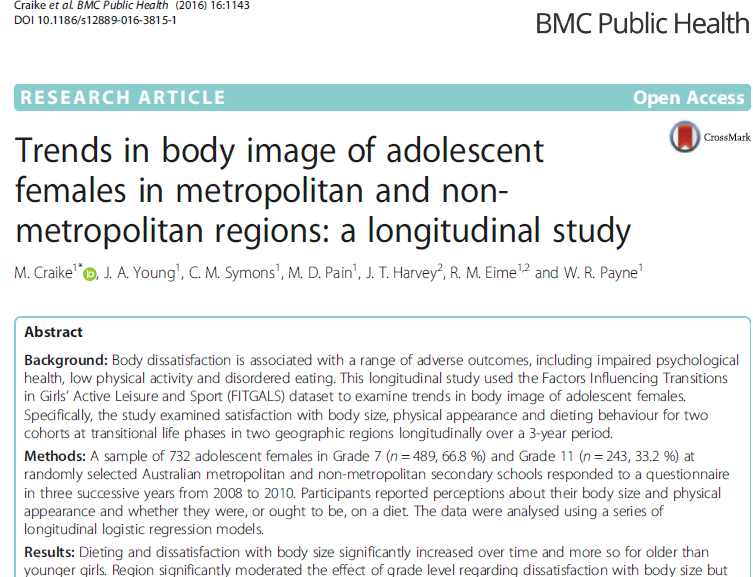 Casey, M., Eime, R., Bull, K., Payne, W. (2011) Characteristics of physically active and inactive men from low socio economic communities and housing estates: A qualitative study using the socio ecological model. Annals of Leisure Research. 14(1). 1-21.